* Those who wish to join can call vihara and make arrangements to come for a training session. "All human beings came from a single African Mother". This is not a subjective statement made by an African or anyone who had a fascination towards African Culture. This was stated in different words in a Ph. D. Dissertation in Genetics by a graduate student who later became a prominent scientist. We all know that every human being comes to this world biologically from a mother. The duty of the mother is not over after giving birth to a child - it is the beginning of a life long commitment. From there onwards the mother has a long plan relating to the health, food, security, upbringing, education, employment, and marriage of her child. The list of expectations goes even further and extends as far as to the grandchildren of the mother and the duties of her own children after her death. The mother of a child is also one of his or her first teachers. Though children sometimes think of their mother as a nuisance because of her sense of possessiveness of her children, the mother never thinks of her children as a nuisance. How can we accuse her of over possession? To a mother, her child is an important part of her own body. We know what a lot of pain is undergone by a mother to present a child to the world. But if you would ask a mother, she would say that all her pain was gone as soon as she saw her baby. A mother's love for her child is incomparable. Even though the umbilical cord is severed physically at birth, there is another similar cord which invisibly ties the child with his/her mother. The Buddha mentioned that 'one should spread loving-kindness (Metta) to all beings as a mother protects her only child - she considers her own life as secondary when she thinks of the security of her child.' The Buddha who banned giving out the things that belongs to the order of Sangha made an exception to the rule by saying that the monks and nuns have permission to give what they have to their parents who are sick and convalescent in their old age. Upanishadic teachers advised their pupils to consider their parents and teachers as the creator god. According to this mothers are entitled to be respected twice since they come under both categories as mothers and teachers. Yes, mothers teach their children how to behave well in society. So, for any misbehaviour of a child the mother is always blamed. But there is a guarantee that your mother will defend you when you are defenceless. 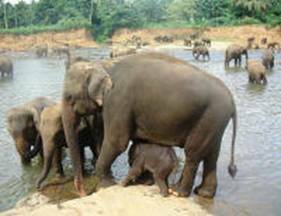 We are dead scared to go close to an animal, which breast-feeds her young ones. Even the most timid among animals is ready for a fight to protect her young puppies. When we are unhappy or in pain the soothing words that automatically come out of our mouths are "O, mother" (ammee). We call our mother to complain to her that we are not well for whatever reason. In any type of despair or mishap we turn to our mother for protection and love. Each of us has a unique experience regarding our own mother. Our mother treats us the best way she knows. One cannot put the blame on one's mother saying that she mistreated her children. She did the best she could because there are no schools to train people to be good mothers. Though there is only one day reserved to show our love, respect, and gratitude to our mothers, there should be three hundred and sixty five days to show our respect and love to our mothers for everything that they have done for us. But this is a good opportunity to think about all the mothers who contribute to make this world a better place by bringing up all of us. We must think of the mothers who lost their beloved ones in war. You may know a mother who is expecting her son to come back to her though her son lost his life more than thirty years before. 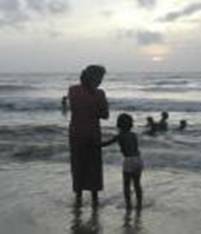 Whether we call Sri Lanka’s lost sons soldiers, freedom fighters, or terrorists, all of them are children of mothers. We can see that there are increasing numbers of mothers in the world who wait for their beloved ones to come back from war and other disasters. Mothers who lost their children and mothers who lost the fathers of their children are suffering the most. We can go beyond our shores and think of the mothers who suffer because they lost everything they had. It does not matter where they are, who they are, how old they are, they are suffering because the world destroyed their most sacred contribution to the world- their children - which they gave from their flesh and blood. 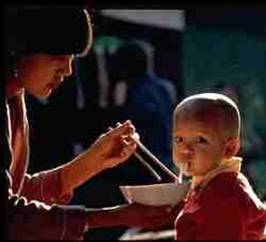 We can think of widowed mothers who have nothing to feed their children and finally made up their minds to sell themselves because they could not keep their children in hunger. There are mothers who have been cornered to live in homes for the elderly, hospices, or to live on the side of roads because they have nobody to help them for various reasons. There are children who do not remember the love of their mothers because their mothers had to leave them in orphanages. They are deprived of the most wonderful love of mothers, which is the main source of life support for a human being. There are mothers who, though they have not given birth to children, they bring up their adopted children with same love and care. The mother of each of us represents all the mothers in the world, including Mother Nature. Three weeks back some of us went to our mothers and paid them our respects for the Sinhala and Hindu New Year. We can do something more to please our mothers if we could give them back the loving kindness (Metta), compassion (karuna), joyousness of the happiness of others (mudita), and the equanimity (upekkha) that we received from our mothers. That will be the most wonderful gift that we present to our mothers. And also we can respect our mothers by practising these virtues towards ourselves and the rest of the world. How can we practise these sublime virtues in return? When we spread friendliness/loving kindness we should do that in the same way as a mother who protects her only child. That means we befriend others with no reservation at all. In an unfriendly environment nobody feels secure. Metta is there to ensure security to all and to create an environment which promotes coexistence. There, no one is going to be controlled by the other based on the presumption that the controller's position is far above the controlled. Your mother created a friendly environment at home and outside for you to grow up. Even when you were out in school or somewhere else you knew that your best friend - your mother - was there to protect you from any trouble. Karuna (compassion) means to help the other person when the need arises. Without welfare, no society can exist. Regardless of our ethnic or religious background we fall ill. Even the materially richest person among us may lose whatever he/she has. Emotional support is necessary when we are unhappy in a situation such as the death of a beloved one. When we face these mishaps in life we need the help of others. Our mothers took care of us to their maximum capacity. When we needed them they were there to save us from trouble. Mudita which is to be pleased by seeing others' happiness- it is the easiest and cheapest precept to practice because we need nothing materially to practise this virtue, though it may be difficult for some people to be joyous of others' happiness. By being a practitioner of mudita one appreciates the achievements of the other which is another key concept that provides us with an opportunity to have a positive opinion about the other person who lives with us. Your mother was the happiest to see the smile on your face which came as a result of something that you achieved in life. While we practise these three virtues how can we develop equanimity, or upekkha, which is to maintain a neutral position without extremes? How can we do that? Why can't I control the person that I give my friendship or compassion to and not be jealous of the happiness of him/her? Each of us is a different individual and our identities are different. We should learn to enjoy these differences. I may be a Buddhist/Sinhala and the other person may be a follower of another religion or a member of another ethnic group- one's racial/religious identity can be viewed as a coincidence of birth. Still, we are noble human beings who respect the differences of each other. Once children leave the family, mothers treat them as separate individuals because they develop equanimity. It does not mean that we lose the love and compassion of our mother. They realize that we have a life of our own. By bringing us up in this way mothers taught us- to give loving kindness, compassion, joyousness of the happiness of others and equanimity to society- is the best way to make our mothers happy. as a mother loves her one and only child. Yet you are still our beloved Teacher. Without constructing a God to believe in. By meditating and right living. Rather a way out of life’s miserable wheel. Your community of monks, nuns and lay people. All hues of gold, brown and pink. From Sri Lanka, Myanmar, and America. Meditator, Lover of all castes and races. Through their very breath, not just their words. In your temple, home of beloved monks. Peace, beauty and love with the world. None is more beautiful than you. The significance of Vesak lies with the Buddha and his universal peace message to mankind. 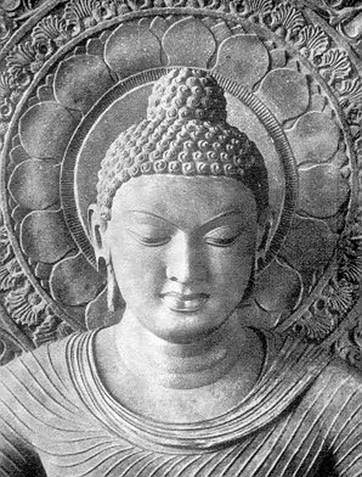 As we recall the Buddha and his Enlightenment, we are immediately reminded of the unique and most profound knowledge and insight which arose in him on the night of his Enlightenment. This coincided with three important events which took place, corresponding to the three watches or periods of the night. During the first watch of the night, when his mind was calm, clear and purified, light arose in him, knowledge and insight arose. He saw his previous lives, at first one, then two, three up to five, then multiples of them .. . ten, twenty, thirty to fifty. Then 100, 1000 and so on.... As he went on with his practice, during the second watch of the night, he saw how beings die and are reborn, depending on their Karma, how they disappear and reappear from one form to another, from one plane of existence to another. Then during the final watch of the night, he saw the arising and cessation of all phenomena, mental and physical. He saw how things arose dependent on causes and conditions. This led him to perceive the arising and cessation of suffering and all forms of unsatisfactoriness paving the way for the eradication of all taints of cravings. With the complete cessation of craving, his mind was completely liberated. He attained to Full Enlightenment. The realization dawned in him together with all psychic powers. This wisdom and light that flashed and radiated under the historic Bodhi Tree at Buddha Gaya in the district of Bihar in Northern India, more than 2500 years ago, is of great significance to human destiny. It illuminated the way by which mankind could cross, from a world of superstition, or hatred and fear, to a new world of light, of true love and happiness. The First Noble Truth is the Truth of Dukkha which has been generally translated as 'suffering'. But the term Dukkha, which represents the Buddha's view of life and the world, has a deeper philosophical meaning. Birth, old age, sickness and death are universal. All beings are subject to this unsatisfactoriness. Separation from beloved ones and pleasant conditions, association with unpleasant persons and conditions, and not getting what one desires - these are also sources of suffering and unsatisfactoriness. The Buddha summarizes Dukkha in what is known as the Five Grasping Aggregates. Herein, lies the deeper philosophical meaning of Dukkha for it encompasses the whole state of being or existence. Our life or the whole process of living is seen as a flux of energy comprising of the Five aggregates, namely the Aggregate of Form or the Physical process, Feeling, Perception, Mental Formation, and Consciousness. These are usually classified as mental and physical processes, which are constantly in a state of flux or change. When we train our minds to observe the functioning of mental and physical processes we will realize the true nature of our lives. We will see how it is subject to change and unsatisfactoriness. And as such, there is no real substance or entity or Self which we can cling to as 'I', 'my' or 'mine'. When we become aware of the unsatisfactory nature of life, we would naturally want to get out from such a state. It is at this point that we begin to seriously question ourselves about the meaning and purpose of life. This will lead us to seek the Truth with regards to the true nature of existence and the knowledge to overcome unsatisfactoriness. From the Buddhist point of view, therefore, the purpose of life is to put an end to suffering and all other forms of unsatisfactoriness - to realize peace and real happiness. Such is the significance of the understanding and the realization of the First Noble Truth. The Second Noble Truth explains the Origin or Cause of suffering. 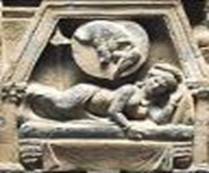 Tanha or craving is the universal cause of suffering. It includes not only desire for sensual pleasures, wealth and power, but also attachment to ideas', views, opinions, concepts, and beliefs. It is the lust for flesh, the lust for continued existence (or eternalism) in the sensual realms of existence, as well as the realms of form and the formless realms. And there is also the lust and craving for non-existence (or nihilism). These are all different Forms of selfishness, desiring things for oneself, even at the expense of others. Not realizing the true nature of one's Self, one clings to things which are impermanent, changeable and perishable. The failure to satisfy one's desires through these things; causes disappointment and suffering. Craving is a powerful mental force present in all of us. It is the root cause of our sufferings. It is this craving which binds us in Samsara - the repeated cycle of birth and` death. The Third Noble Truth points to the cessation of suffering. Where there is no craving, there is no becoming, no rebirth. Where there is no rebirth, there is no decay. no, old age, no death, hence no suffering. That is how suffering is ended, once and for all. The Fourth Noble Truth explains the Path or the Way which leads to the cessation of suffering. It is called the Noble Eightfold Path. The Noble Eightfold path avoids the extremes of self-indulgence on one hand and self-torture on the other. It consists of Right Understanding, Right Thought, Right Speech, Right Action, Right Livelihood, Right Effort, Right Mindfulness and Right Concentration. These path factors may be summarized into 3 stages of training, involving morality, mental culture and wisdom. Morality or good conduct is the avoidance of evil or unwholesome actions -- actions which are tainted by greed, hatred and delusion; and the performance of the good or wholesome actions, - actions which are free from greed, hatred and delusion, but motivated by liberality, loving-kindness and wisdom. The function of good conduct or moral restraint is to free one's mind from remorse (or guilty conscience). The mind that is free from remorse (or guilt) is naturally calm and tranquil, and ready for concentration with awareness. The concentrated and cultured mind is a contemplative and analytical mind. It is capable of seeing cause and effect, and the true nature of existence, thus paving the way for wisdom and insight. Wisdom in the Buddhist context, is the realization of the fundamental truths of life, basically the Four Noble Truths. The understanding of the Four Noble Truths provide us with a proper sense of purpose and direction in life. They form the basis of problem-solving. The message of the Buddha stands today as unaffected by time and the expansion of knowledge as when they were first enunciated. No matter to what lengths increased scientific knowledge can extend man's mental horizon, there is room for the acceptance and assimilation for further discovery within -the framework of the teachings of the Buddha. The teaching of the Buddha became a great civilizing force wherever it went. It appeals to reason and freedom of thought, recognizing the dignity and potentiality of the human mind. It calls for equality, fraternity and understanding, exhorting its followers to avoid evil, to do good and to purify their minds. Realizing the transient nature of life and all worldly phenomena, the Buddha has advised us to work out our deliverance with heedfulness, as 'heedfulness is the path to the deathless'. His clear and profound teachings on the cultivation of heedfulness otherwise known as Satipatthana or the Four Foundations of Mindfulness, is the path for the purification of beings - for the overcoming of sorrows and lamentation, for the destruction of all mental and physical sufferings, for the attainment of insight and knowledge and for the realization of Nibbana. This has been verified by his disciples. It is therefore a path, a technique which may be verified by all irrespective of caste, color or creed. Kamesu micchacat´ra veramani sikkhapadam samadiyami. knowledge and conduct, sublime, knower of the world, unsurpassed leader of men to be tamed, teacher of gods and men, enlightened, exalted. The Dhamma has been well expounded by the Exalted One, visible here and know, immediate, inviting to come and see, leading onwards, to be known by the wise for themselves. field of merit for the world. With lights of candle burning brightly, destroying darkness, I revere the Buddha, light of the triple world who dispels all darkness here. I revere him who is rightly revered, worthy of the highest reverence. With this bunch of flowers, colorful, fragrant and excellent, I revere the lotus feet of the Lord of sages. flower (flowers) fades away, so will this body be destroyed. Please accept from us, Venerable Lord, this water that is humbly offered. Out of compassion for us, please receive this, Oh supreme One. Please accept from us, Venerable Lord this beverage that is humbly offered. Out of compassion for us, please receive this Oh supreme One. 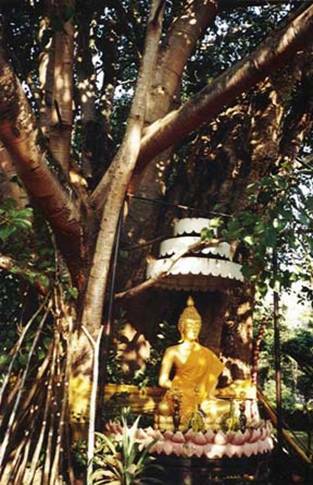 I venerate all Stupas wherever they are found, the bodily relics, the great Bodhi tree an all images of the Buddha. 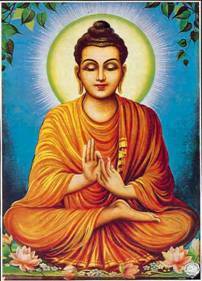 I always meet with the wise until Nibbana is attained. If by deed, speech or thought, heedlessly I have done any wrong, forgive me, Oh Master! Oh Victor greatly wise. Chief Sangha Nayake of North America. This is to say thank you to all who came forward to donate money and other items to tsunami victims in Sri Lanka. My heartfelt gratitude is extended to general public, leaders of the community, religious organizations, and media institutions for the support given to us. I was told that a constant in flow of kind people to the Buddhist Vihara leant emotional and material support at that tragic moment of history. I would like to let you know with gratitude that the Washington Buddhist Vihara was able to raise more than forty five thousand dollars to be sent to Sri Lanka. We also sent several shipments of other items donated to us. I was in Sri Lanka when the tsunami hit and as the president of JANAVIJAYA FOUNDATION, SRI LANKA (JVF) I was helping to organize relief work. JVF was one of the first organizations to go to tsunami-struck areas for relief work. A current up- date of JVF services is provided elsewhere in this newsletter. It is my great pleasure to commend the office bearers, members, resident monks, and well-wishers of the Buddhist Vihara for their ardent support to raise funds to help victims of the tsunami, and to conduct all the religious ceremonies for the benefit of the victims of the tsunami. I would like to express my sincere thanks and gratitude to Venerables E. Gnanaratana, T. Sutadhara, and K. Vidura who were resident monks at the vihara in my absence for their hard work and dedication to handle all the activities at the Vihara. May the Blessings of the Triple Gem be with you ( TERUWAN SARANAI). Siri Vajiranana Dharmayatanaya, Maharagama, Sri Lanka. Janavijaya Foundation (JVF) is a non-profit organization that was founded by the late-venerable Gangodawila Soma Thero to encourage people to develop a life style based on famous five precepts inherited by Asian faith traditions. After the sudden demise of the founder the JVF continues its services under the leadership of Venerable Maharagama Dhammasiri Maha Thero, President, Washington Buddhist Vihara, USA. JVF is committed to operate as an organization which provides welfare to the needy as a way of practice of loving kindness towards the world. Though the leadership of JVF is provided by Buddhist clergy it is an organization which serves to the needy regardless of their religious, ethnic, or cultural backgrounds. This letter of appeal is to request help for the victims of the recent tsunami flood in the coastline of Sri Lanka. More than eight hundred thousand people were left homeless due to this huge disaster while many lost their lives. At the time this disaster happened, the Janavijaya foundation (JVF) had to play the role of a leading volunteer service provider for the people who lost their homes. Janavijaya provided basic needs essential for the victims. Over 150 truck loads of food, clothing, medicine, and other supplies needed were sent off to help our fellow citizens who were helpless. When the Government of Sri Lanka was ready to handle the responsibility of taking care of the immediate needs of tsunami victims, Janavijaya decided to divert its attention more to address the long term needs of the people affected by the tsunami. As the next step of relief work presently we are involved in organizing medical clinics in the tsunami struck areas with the help of medical professionals to improve the health conditions of the people mentally and physically. The Buddhist monks visit refugee camps or the villages to give pastoral care and to bless people by chanting Pirith (discourses of the Buddha). All of those programs are organized and sponsored by Janavijaya Foundation with the help of kind generosity of the members and well-wishers of the JVF. 1. HOUSING DEVELOPMENT PROJECT - to repair and to build houses and help homeless people to resettle in their traditional villages. Each house cost about Rs.200, 000 –Rs 300, 000 (US $ 2000 - $3000). Since we believe in developing the community with the contribution of the community the home owners must participate in building their homes by giving their labor while we bear the cost of the material resources and specialized services in need. 2. PRESCHOOL ESTABLISHMENT PROJECT - First we open preschools in the preaching halls which are not affected by the tsunami while the construction of preschool buildings goes on. All expenses including the allowances of Pre school teachers are provided by JVF. It costs about Rs.700, 000 ($7000) to build a preschool building for thirty kids. AHRENSBURG – JANAVIJAYA KINDERGARTEN - We have already initiated the construction of a larger preschool in Madihe in down south Sri Lanka which is the birth place of late Venerable Madihe Pannasiha Mahanayake Thero who earned highest most respect from the public of Sri Lanka and elsewhere for his lifelong service to humanity. Kindergarten at Madihe, Matara, Sri Lanka which will be a special facility to admit up to 150 students will be funded by the city of Ahrensburg, Germany lead by Rev. Helgo M. Haak. This is going to be named as “Ahrensburg - Jana Vijaya Kindergarten” and is expected to be developed as a training center for preschool teachers. 3. DONATION OF KITCHEN UTENSILS – Each family who goes back to live in their house is given a pack of kitchen items which costs Rs.2500. 4. Scholarship program for primary and SECONDARY school students – We have already publicized this in the newspapers and students must submit their applications through the Janavijaya branch in the district with the recommendations of the principals of their schools. So we can select the relevant person carefully without any inconvenience. · Short-term scholarship scheme for the homeless students who sit for the examinations conducted by the government this year. Each student gets Rs. 2500 monthly. · Long term scholarships for the students who lost one or both parents. We are helping students for their education valued Rs.1500 every month. · If the schools or students request the stationeries or items they want we would like to contribute those on request. The cost of these items varies. 5. REPAIRING PLACES OF WORSHIP -We are planning to repair or help few temples destroyed by the tsunami. Now we have completed the preparation of plans and the estimates of new constructions. At this point we kindly invite those who wish to extend their kind help to our people to get rid of this misery. Please use this opportunity to pay your gratitude to Late Most Ven. Aggamahapandith Madihe Pannaseeha Maha Nayaka Thero and Late Rt. Rev. Gangodavila Soma Thero the Founder of Janavijaya Foundation. Washington Buddhist Vihara, 5017 16th St., NW, Washington, DC 20011, U.S.A. Telephone: (202) 723-0773. Fax. (202)722-1257 www.buddhistvihara.com. THE 38th ANNUAL REPORT OF THE BUDDHIST VIHARA SOCIETY, INC. The Vihara is staffed by resident monks who are available to discuss the various aspects of Buddhism, teach meditation, offer informal and formal courses on Buddhism, and give invitational lectures and meditation workshops at universities, schools, churches and community groups. This Annual Report relates the major events in which the Society engaged during the fiscal year in furtherance of its purposes and goals. The Most Venerable Ampitiye Sri Rahula Maha Thero. His Excellency Mr. Devinda Subasinghe, Ambassador of Sri Lanka. Ven. K. Vidura , and Ven. P. Sobhana . The Vihara was pleased to welcome several Venerable monks who visited the Vihara within the last year. Some of them were, Venerable Maduluwawe Sobhita Thero, Venerable Mutuwadiye Upaseeha Thero, Venerable Aturaliye Ratana Thero, and Venerable Talalle Chandakitti. The property located at 2419 & 2423 Briggs Chaney Road, Silver Spring, is being cared for by a caretaker who resides on the property. Regular donations are being made by the caretaker who helps to defray the cost of operating the property. Although the Buddhist Vihara Society, Inc. is registered as a nonprofit, religious organization in the State of Maryland, the Society was assessed and has paid property taxes for the present taxable year. The application for tax exempt status for the property is still pending. Although the property is located in a zone designated as R 200 and can be used for religious purposes, the construction of a temple & meditation center at this site will still involve several permit approvals by the Maryland authorities. At present the society is continuing the process of establishing a solid financial building fund base which would be used for constructing the new center. Regular Vandana services were held every Sunday at 3:00 PM. Some monthly Uposatha Full-Moon Day observances were held on the Sunday closest to the Full Moon (Poya) Day. Activities on designated days commenced at 9:00 AM with the observance of the 8 precepts, followed by Vandana Service and meditation. Dhamma discussions, sermons, and Vandana services were included in the afternoon sessions, which ended at 4:00 PM with a brief meditation exercise. Some additions and changes have been added to the Vihara’s meditation schedule. Venerable P. Sobhana continued to teach insight meditation on Wednesday and Saturday from 7:00PM to 9:00 PM. The class has continued to expand and attract a diversity of students. Many westerners have been cultivating a sincere interest toward the benefits of meditation and teachings of the Dharma. The Vihara has benefited from his skillful insights and compassionate nature. 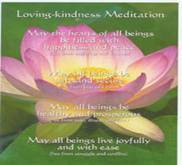 A Zen Meditation group also conducts classes on Thursday from 7:00PM to 8:30PM. The participants engage in sitting and walking meditation. In addition, on each Sunday at 7:00PM the Washington Mindfulness Community at the Vihara conducts meditation sessions. The Buddhist Vihara is currently offering a special sutta Dhamma class every other Friday at 7pm . Michael Roehm, a long time scholar of Buddhist studies, provides instructions. In 2003 the Washington Buddhist Vihara continued to provide Dhamma and Society news on our website www. buddhistvihara.com. Through this global medium, seekers of Buddha’s teachings can directly pose questions regarding Dhamma to Venerable monks. At present, Most Venerable Punnaji Maha Thera, Professor, Venerable Dhamma Vihari Thera, and Most Venerable Dhammasiri Thera are available for answering questions. The website is maintained by Mr.Saman Wickramanayake. During Vas season the monks who observed Vas at the Vihara preached Dhamma sermons on different topics on Sundays. President, Ven.M. 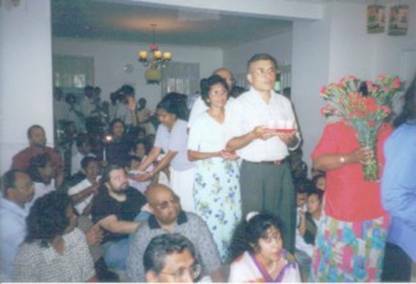 Dhammasiri Thero was invited to speak on Buddhism and Environment in Summer 2004 at theMethodist Church, Wisconsin Ave, Washington, DC. On a regular basis Bhante delivered sermons at the National Cathedral, Washington, DC and Interfaith Conference of Washington DC. COMMEMORATIVE SERVICE FOR MOST VENERABLE MADIHE PANNASIHA MAHA NAYAKE THERO, THE FOUNDER OF WASHINGTON BUDDHIST VIHARA SOCIETY,INC. Following the Sri Lankan Buddhist customs a memorial service to transfer merit to our founder, Most Venerable Madihe Pannasiha Mahanayake Thero by offering DANA to the Sangha was organized on December 14th 2003. Sri Lanka Ranga Kala Kavaya and the Buddhist Vihara Society together organized this noble event to pay our respect and gratitude to the late-grand master of Buddhist order of Sangha who rendered a great service for the perpetuation of the teachings of the Buddha. A brief sketch of the biography of the late Mahanayake Thero was distributed during the ceremony. Our quarterly newsletter has been highly successful due to the dedicated efforts of the editorial board. The staff for 2004 was Hon.Editor: Ven. Dhammasiri Thera, Editor: Venerable P. Sobhana, and Prof. Carlota Okampo, and News Editor Mr. Sanath de Silva. The biweekly Sunday Dhamma School for children is conducted and organized by Mr. Udaya Ranawaka. The classes were open to children of all ages and conducted in English. Approximately 50 students encompassing diverse American ethnic groups attended the classes. Ven. M. Dhammasiri Thera, Udaya Ranawake, Priyankara Hennayake, Manasshantha Abeysekera, Jayantha Hettipola, Udayan Barua, Nayana Ranasinghe, Sharmila Dabare, Kumar De Silva and Hemnath De Silva were the instructors. The Washington Mindfulness Community conducted meditation sessions each Sunday at the Vihara from 7:00 to 9:00 PM. They practice Anapanasati as taught by the Venerable Thich Nhat Hanh. The Washington Mindfulness Community was formed in 1989 and is composed of men and women inspired by the teachings of Buddhism and Ven. Thich Nhat Hanh, a Vietnamese Zen Master, peace activist, and writer. The members come together to meditate, to deepen their understanding of the practice of mindfulness, to encourage and inspire each other through dhamma discussions and mindful actions, to support each other through difficult times and to celebrate the joys and wonders of life. The annual Kathina Ceremony of the Washington Buddhist Vihara Society was held at the Vihara on Sunday, October 26th , 2003. The Ceremony was well attended by the international Buddhist community of the greater Washington DC area: Vietnamese, Burmese, Chinese, Thai, Bangladeshi, Indian, American and a large number of Sri Lankan Buddhists. The Kathina Ceremony was sponsored by Mr. Gayanga Opatha, Mr. Mahil Abewarna, Mr. Upul Abewarna, Mr. Prakash Williams, and all the devotees of the Vihara. The Buddha Pooja was conducted by Bhante K. Vidura of the Washington Buddhist Vihara. The Dhamma talks were given by Venerable Madawela Punnaji Maha Thera and Venerable Yogavacara Rahula Maha Thera, U.S.A. 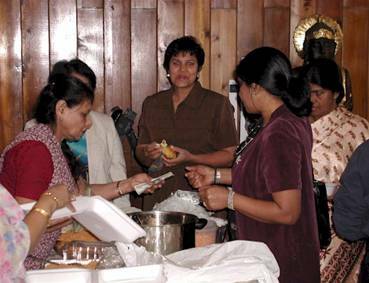 The Sanghamitta Day Celebration and the Society's 38th Annual General Meeting (for the fiscal year October 1, 2003 to September 30, 2004) were held Sunday, March 14, 2004 at the Vihara. The Sanghamitta celebration commenced with the Asian Food Bazaar, featuring Indian, Vietnamese, Burmese, Bangladeshi, Chinese, Thai, Malaysian, and Sri Lankan food. Vandana and Buddha Pooja were held at 3:00 PM. The AGM and the Sanghamitta Day Commemoration started at 3:00PM with a welcoming speech by Mr.Sena Basnayake, the vice President of the Vihara. From 2:00 PM to 2:45 PM Ms. Liza Knight gave the keynote address. The 38th Annual General Meeting commenced at 3:00 PM. James Shaffer, the Hon. Treasurer read the financial report and Susan Anderson, the Hon. Executive Secretary of the Buddhist Vihara Society presented the annual report. The celebration ended at about 5:00 PM after a blessing service (seth pirith) by the Maha Sangha. The Vesak Festival was held on Sunday May 09th, 2004 at the Vihara. The ceremonies began at 9:00 AM with the hoisting of the American and Buddhist flags. Venerable. Dhammasiri Thera commenced the program by administering the Eight Precepts, Vandana and Admonishment. Venerable Sanghasobhana conducted Bhavana (Meditation). Venerable Yogavacara Rahula Thero of Bhavana Society gave a Dhamma talk. The Buddhapuja was conducted by Venerable Pandit K. Vidura Thero . In the afternoon, Venerable Pandit T.Chandakitti Thero guided group chanting (Paritta) and Venerable Yogavacara Rahula led The Dhamma discussion. At 1:45 Ms. Lisa Knight gave a Dhamma Talk. 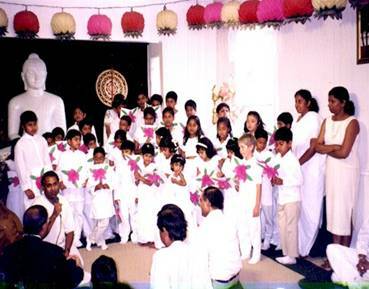 Then the Buddhist Vihara Sunday School children presented Devotional songs. There were three Dhamma Talks by Venerable Pathegama Gnanappiya Thero, Venerable Eluwapola Gnanaratana Thero, and Karaputugala Indaratana Thero respectively . The day concluded with "Observing the Five Precepts” and Bodhi Puja conducted by Venerable Talalle Chandakitti Thero. The Vesak Dana was organized by Mrs. Chandra Gunaratne, Mrs. Rani Karunaratne, Mrs. Nelum Basnayaka, and Mrs. Sunila Dharmasiri. Under the patronage of Mr. Devinda Subasinghe, Ambassador of Sri Lanka, the Annual Food Bazaar was organized by the staff of the Sri Lankan Embassy and held on Sunday, June 6th, 2004. The proceedings of the Food Bazaar were donated to the New Vihara Building Fund. The Board of Directors met approximately once per month between October 1, 2003 and September 30, 2004, and also for special meetings. Various Board committees held meetings throughout the fiscal year. We wish to note the sudden demise of and transfer merit to late venerable Gangodawila Soma Thera, who dedicated his life to awaken Sri Lankan Buddhists to follow the path of the Buddha. The late Thera passed away on December 12th, 2003 while he was traveling in Russia. The President of the Washington Buddhist Vihara Society, the Ven. M. Dhammasiri Thera, and the Board of Directors, recognize the vital services rendered by all contributors to the Vihara. We express our appreciation to the patrons of the Vihara, the late Most Venerable Madihe Pannasiha Mahanayaka Thera and the Most Venerable Ampitiye Sri Rahula Maha Thero, to the Embassy of Sri Lanka in Washington, DC, and to his Excellency Mr. Devinda Subshinghe, the Ambassador of Sri Lanka. We are indebted to all the members and friends of the Washington Buddhist Vihara Society who supported the Vihara by volunteering their time and labor, especially those who organized various celebrations. Without their efforts many of the celebrations would not have been as successful as they were. We recognized the services performed by the guest speakers at the various celebrations and meetings. Support the Vihara by Becoming a Member! 5017 16 th Street, N.W. The Washington Buddhist Vihara, founded in 1965, and incorporated as a Society in 1966, under the patronage of Most Venerable Madihe Pannasiha Mahanayaka Thera, with Venerable Bope Vinitha Thera as its first President is a religious and educational center dedicated to presenting Buddhist thought, practice, and culture. It is staffed by resident monks who are available to discuss the various aspects of Buddhism, teach meditation, offer informal courses and by invitation, give lectures and meditation workshops at universities, schools, churches, and community groups. The Vihara also operates a Buddhist Book Service with a mail order service; a free list of current stock is available on request. The Vihara Library, contains works covering all facets of Buddhism. Every Sunday at 3.00 p.m. there is a devotional service which is followed by Dhamma discussion and meditation. Visitors, regardless of religious affiliation, are invited to participate in Vihara activities as well as come in and browse in the library and Book Service. The meditation room and shrine room are always open for individual meditation and devotion.